Anyone can have a manicure or pedicure, or even a decent chair massage. But if you want a truly unique spa experience, why not have your own in home spa experience! Today’s society is jam packed with things you have to do every day, driving to the spa can take you 30-60 minutes depending if there’s traffic or even a car accident that can make the spa cut your treatment short since you didn’t arrive on time. We are as convenient as Uber and as high quality as a limousine! With Signature Mobile Spa, we drive to you and take the “work” out of going to the spa. What is nicer than having a relaxing service in the comfort of your home? You don’t have to risk smudging a nail, or even leaving after a relaxing massage or facial. Our in home spa services are all about professional, top quality, individualized attention customized to you. 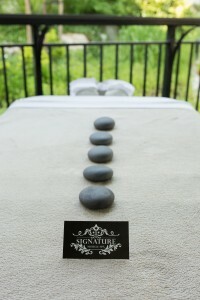 Signature Mobile Spa is the brand of Carmen Ribeiro and Karen Wilson. These two Vancouver ladies saw a need for professional, quality, yet cordial spa services that can be delivered to them at the location of their choice. Originally, the company started in 2009 as Bliss Spa Mobile but quickly began to grow. In 2014, they re-branded their company into Signature with the same staff, just new look and new logo. Their spa services are brought to our clients in their home, hotel suite, office, or retreat. Both Karen and Carmen are licensed estheticians with formal education and years of experience. Check out our Team to find more about us and our estheticians. In addition to individual treatments, their services are also geared towards parties. In their experience, they found that most spas can’t host parties of more than a handful of guests. But with Signature, their extensive staff comes to your venue to accommodate whatever size party you desire, small or large. We have successfully pampered over 5000 parties why don’t you be the next to have a Signature Party! We make party planning easier! How you ask? We know that hosting any kind of party can be time consuming and challenging. With our unique online client form, we collect you and your guests treatments and names, all you have to do is send our link to your guests and send us a deposit… We take care of the rest! Three days prior to your party we will prepare the day or evenings appointment schedule and send it to you and your guests. Guests will know what time their treatment(s) is at, therefore we can accommodate guests having to leave early or arrive late. We will provide everything needed for the spa portion of the party we just need seating for you and your guests and access to a sink. Book us for your spa party, corporate event, couples treatments, or individualized treatment!